* English language material below is from the following countries: Bhutan, India, Kenya, Madagascar, Nepal, Philippines, Sierra Leone and Zambia. TNAU. Updated 2017. System of Rice Intensification (SRI). TNAU Agritech Portal website. TNAU. Updated Nov. 2015. System of Rice Intensification (SRI) Cultivation. TNAU Agritech Portal website. PRAN. SRI method of paddy cultivation. Preservation and Proleferation of Rural Resources and Nature (PRAN) website. Bihar, India. System of Rice Intensification - Principles and practices. Directorate of Rice Development, Patna, Bihar. 6 p.
Jat, Aanandi Lal. 2013. Increasing rice production through System of Rice Intensification. Popular Kheti 1(1): 10-14, January-March. Rice: System of Rice Intensification. IKISAN Agriportal website. 2007. SRI in Large Irrigation Projects in Andhra Pradesh, India. Jalaspandana website. [online booklet that details the System of Rice Intensification (SRI) method of paddy cultivation carried out by JalaSpandana in Rajolibanda Diversion Scheme, Priyadharshini Jurala Project and Kurnool Cuddapah Canal in Krishna Basin in Andhra Pradesh. Techniques for carrying out comparative analysis are also included]. Lasway, Octavian J. 2016. System of Rice Intensification (SRI). Green Agriculture Skills website. April 14. [Series from Tanzania about how to use SRI methods. This is the first entry. The second is on seedbed preparparation (April 19). Styger, Erika, et Devon Jenkins. 2015. Manuel Technique sur le SRI en Afrique de l'Ouest. Site web SRI-WAAPP. [Compilé par le projet de l'Amélioration et mise à l'échelle du Système de Riziculture Intensive en Afrique de l'Ouest]. 2011. Système de Riziculture Intensive (SRI). Collection Guides Practiques du CTA No. 17. Groupmement SRI Madagascar website. 8p. [French language SRI manual published by CTA in collaboration with GDC and the Groupement SRI Madagascar] (also available at http://www.anancy.net/documents/file_fr/PracGuide17Fr.pdf). Association Tefy Saina. 2006. Voly Vary Maro Anaka: Systeme de Riziculture Intensive. Association Tefy Saina website. (36p., 3.1MB pdf) [Malagasy language SRI manual, also online on CIIFAD's System of Rice Intensification website. This version has contains both French and Malagasy text]. Hasbullah, Habib. 2016. Cara menanam padi organik dengan metode SRI (System of Rice Intensification). mitalom.com website. March 19. Adnany, Zaki. 2013. Budidaya padi dengan pendekatan teknologi SRI (System of Rice Intensification). E-Petani website. March 22. 2011. SWI manual (in Hindi). As a pdf from JEEVIKA and a PowerPoint presentation by PRADAN. 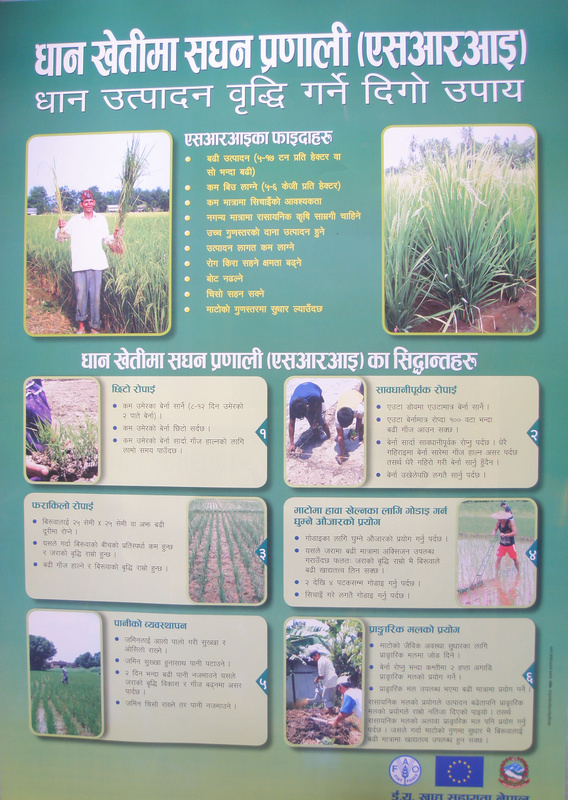 Instructional material about the System of Wheat Intensification (SWI) methods used in Bihar. 2006. SRI Method of Paddy Cultivation. Watershed Support Services and Activities Network website. (20p. pdf) [Oriya language manual originally published in Telugu language for farmers by WASSAN with input from K. Rao, WWF, ICRISAT, CRISP, J.Raju, ANGRAU, Sitaramaswamy, and the People's Science Institute.] (also available in English, Hindi and Telugu versions). SRI extension bulletin (Telugu). RASS-ARKVK. System of Rice Intensification website. (16p.,1.35 MB pdf). [This Telugu language manual was obtained from P. Balahussain Reddy, Training Associate (Agricultural Extension), RASS-ARKVK. 2000 hard copies were provided to extension functionaries, officers of the state agriculture department, NGOs and farmers]. A separate English language introduction to the Thai version and a related Thai version with an English title and author page (41p., 445 KB pdf) are also available on the System of Rice Intensification website).